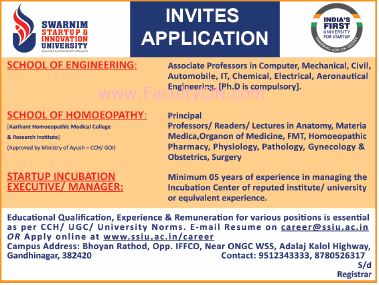 Swarnim Startup & Innovation University, Gandhinagar has advertised for recruitment of Teaching Faculty- Professor / Associate Professor / Lecturers / Readers / Principal jobs vacancies. Interested and eligible job aspirants are requested to apply immediately from 28th November 2018. Check out further more details below. About University: SSIU is a thriving preeminent university which will work as a hub-and- spoke model where disciplines like Engineering, Architecture, Design, Science, Management, Paramedical and other streams will get its value enhancement through Innovation, startup and entrepreneurship. At SSIU, Entrepreneurship is a value that pulses through the educational, research and Innovation. SSIU is a leading university that maintains a particular commitment to exceptional educational instruction. How to Apply: Interested and eligible candidates are requested to send application along with complete resume, copies of certificates / testimonials and recent PP size photos to the email address provided below or apply online.